This weekend I am trying to do exactly that. Make it seem like a weekend. Today and possibly tomorrows journals will likely be shorter than normal unless I start rambling. Anyone who has read any of my journals knows that I am not guilty of that. Well lets rephrase that and juts say. ……….. Oops! 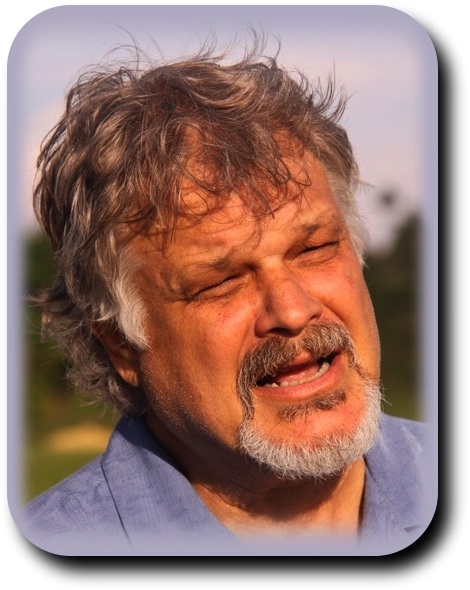 There I go rambling on again. This morning I finished up on this weeks journal and got it posted to my blogg. This after noon I took a bunch of the neighborhood kids swimming at a near by hot springs. This evening I fed kids. Now who says I can’t be short and to the point when I have to. I’m sure glad that I don’t have to very often though. This morning it looked like Fernando was going to be the only one coming along to church with me but between my house and the end of my alley we gained 4 more kids. The pastors message was exactly what was needed this morning. It was about persevering even when things happen that you would not like to see happen. As it turned out he was perhaps the one who needed the message the most. Before he got to church this morning an electric transformer that is located directly in front of our church blew out. This not only meant no sound system for an unusually over crowded church but it also meant that there was no over head projector for the songs that we sang and none of the electrical instruments worked. Not only that but one of the reasons that pastor Mike arrives at church a few hours before the service is so that he can type out a set of notes for his interpreter of follow. No he does not use a typewriter he uses a computer that runs on electricity. Oddly enough the electric ceiling fans that help keep the temperature of our church down to tolerable also run on electricity. So does the projector that runs the short movie that was going to be used as an introduction to this mornings message. It was suggested that he and his interpreter act out the movie but that got voted down. Pastor Mike has a fairly good voice but it was no where as loud as the equipment that was working on the blown transformer just out side of the church. Evidently the equipment did not run on electricity. It sounded more like a diesel engine that is used in a freight train. I managed to catch a few words every now and then but I think that pastor Mike taught more by example than by word this morning. He kept his cool. One nice thing is he shouldn’t have to study for a new sermon next week I doubt that anyone who was sitting more than 2 rows from the front of church will know the diffrance if he uses the same one next Sunday. After Church I took the kids out to Martha’s to eat. $16 gave the 6 of us more than we could eat. The kids all offered to help wash my car after church so I said OK. One slip of the garden hose and with in 30 seconds we had a full fledged water fight going. 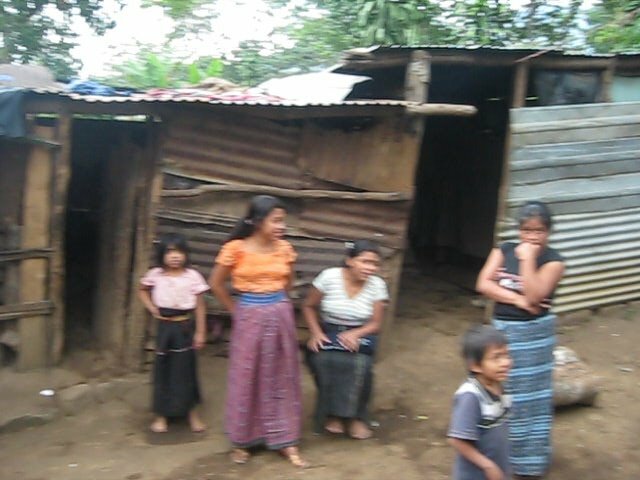 I didn’t think that it was entirely fair when several of the kids took a time out to take off their clothing so that they would not get it wet but I guess that being Guatemalan has its advantages. Rudy who is older and has a bit of modesty and myself were only allowed a short time out to get our wallets out of our pockets. By the time the water fight was over everything was wet. Everything but the car that is. Have you ever tried to get sun baked soap off from a car? It can be a real pain. My car never did get as clean as I had anticipated but the kids had a great time. So did the adults. Believe it or not I am once again in the Bamboo Motel in Mazatenango. This place is beginning to feel more like home than home does. Tonight we are here with 6 of us. Tomorrow we will be met by around 14 people from the USA who will be doing 3 wheelchair distributions with us. Tomorrow’s distribution will be in Ratolao which is about an hour from here and then we plan on having a 2 day distribution in Xela on Tuesday and Wednesday. Well that’s about enough rambling for one night so I will say goodnight. This morning we met up with the team of Americans that are here. 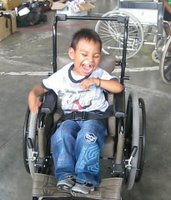 We did a wheelchair distribution in Ratilao. For most of them this distribution was the first that they had ever been on but they all chipped in and everyone enjoyed themselves. Everyone except the first 2 kids that 3 of the Americans and myself seated that is. I occasionally seat some one who is afraid and cries little when they are first put into a chair. It might be that they are frightened seeing so many Americans, Also for most of them being put into a wheelchair is a brand new experience. Then again it could be my face, but I prefer to think that isn’t it. Nevertheless I can usually have them smiling with in a few minutes. Usually but not today. The first 2 little girls that we gave wheelchairs to today cried the entire time that we were seating them. We think that the first one cried the loudest but then again it could be that we had all lost some of our hearing by the time we got to the second one. The rest of the day the kids did great. Towards the end of the day one little boy who we gave a wheelchair to cried at first but we soon had him laughing and playing. It was a good distribution though and by around 2 PM 55 wheelchairs had been given out. We are now in Xela and plan on being here for the next few days. 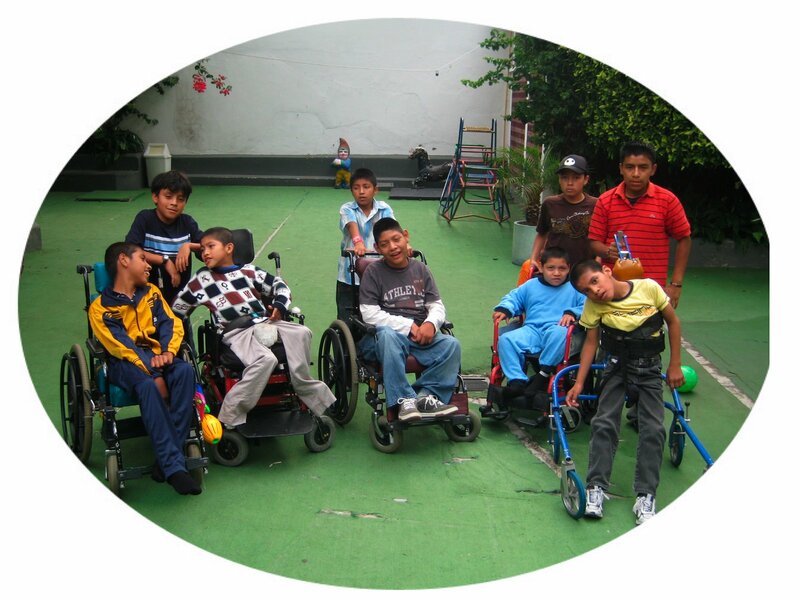 We plan on giving out around 100 wheelchairs here in Xela over the next few days. Just one of the many happy kids. 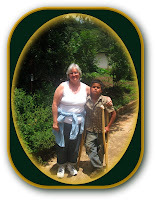 During today’s distribution I got a call from Angelica, the lady who had a new plate put into her leg. She said that she was in a lot of pain andwas running a fever. We quickly phoned Chris’s dad in-law, Gordon and he went out to the coast to pick her up and bring her in to the hospital. We are praying that if she has an infection it can be treated with antibiotics and that see will not need more surgery. A short time later I received a phone call from Amy Deyong. She told me that she had found a 2 year old girl up in Santa Maria Dejesus who is starving to death and wondered if I could help get her admitted into the malnutrition ward at Hermano Pedro. I told her that I would be out of town for the next few days but explained the procedure for getting the little girl admitted into the hospital, to Amy. I wish that I could be there to help her out tomorrow but simply have not yet figured out how to be 2 places at once. 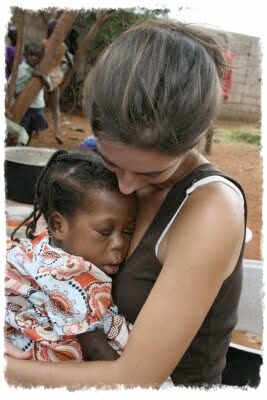 Please pray that this little girl can be admitted into the malnutrition ward as swiftly and as easily as Julio was. I received more phone calls throughout the day, one was from a lady that I know who runs a small orphanage in Chemaltenango. She told me that because of lack of financial support she is going to have to down size. What does this mean? Six of the kids that are in her orphanage are going to have to go. 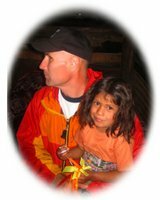 She asked if I could go with her tomorrow to talk to father Jose at Hermano Pedro to see if they could possibly take in these children. Hermano Pedro is already overcrowded but I asked her if she could hang in there until Friday and said that I would try to go in with her then. Another phone call this evening was from my friend Carlos. He informed me that both Byron and Carletos’s power chairs are no longer working. They will have to wait. If you think that I get a lot of phone calls you ought to spend the day with Chris and Donna some time. There phones are continually ringing off the hook. People who are hungry, homeless, in need of wheelchairs or medical attention, or families who can not afford to send their kids to school or in some cases even feed them. The list goes on and on. Praise God we can help some of them but money and man power prevent us from helping a lot of them and that really hurts. I try to make it a point to only present needs and not directly ask for help, but I want to let you know that there are people dying here, and simply patting them on the head and saying I know that God will take care of you just doesn’t do it. How I wish that everyone who reeds these journals could come down here even if it were only for a week or 2. I am sure that if you could only meat some of these beautiful people you would understand why our harts are being broken with the things that break God’s hart. James 2; 14-17 What good is it, dear brothers and sisters, if you say you have faith but don’t show it by your actions? Can that kind of faith save anyone? Suppose you see a brother or sister who has no food or clothing, and you say, “Good-bye and have a good day; stay warm and eat well”–but then you don’t give that person any food or clothing. What good does that do? So you see, faith by itself isn’t enough. Unless it produces good deeds, it is dead and useless. I often close my day’s journal by saying goodnight. Perhaps it is time to wish some of you a restless one. Am I doing the old guilt trip thing? Perhaps, but I am getting tired of seeing children going hungry or dieing needlessly. God has given us so much but often times we are willing to give so little. Today we were able to give out another 50 wheelchairs. There were far more kids today and they usually take much longer to fit than the adults do but the volunteers from the States also had had 1 distribution under their belts so they were able to do a lot more seating on their own. They were all very eager to learn and to help and so were many of the therapists who work at the Fundabium. They did run into 1 5 minute project that took them nearly 2 hours to complete but I can remember back to the days when that often happened to me. Fact is it still happens from time to time but no one says much to me about it. they simply chalk it up to my age. The last person that my team worked with today was a real challenge. He was a boy of 15 who up until today had never been in a wheelchair. Spending his entire life lying on his side had taken its toll. 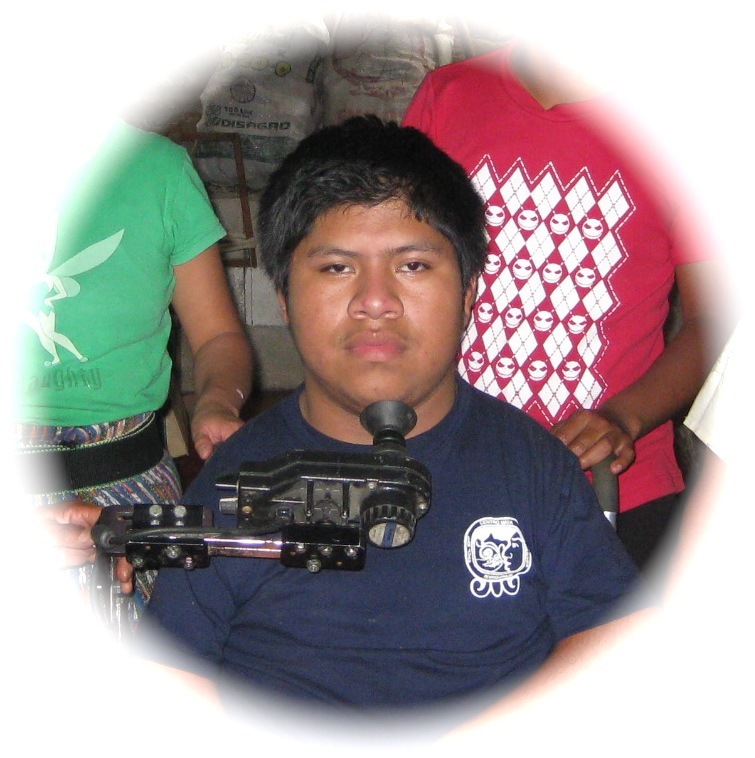 His body was severely twisted and getting him into a comfortable seated position was a real challenge. We used up a lot of foam and I nearly wore out the blade of my electric carving knife but a little over 3 hours after picking out a wheelchair for him he was sitting comfortably with a smile on his face. Tomorrow should prove to be another busy day because we have another 50 people scheduled for a distribution at the same Fundabium that we were at today. I received 2 encouraging phone calls today. The first was from Angelica’s daughter. Evidently the infection or what ever it was that was giving Angelica a lot of pain and a high fever was not all that serious because the hospital was allowing her to go back to her home. My second call was from Amy Deyong. The 2 year old girl that she had called me about had made it through the night and although it had been an all day ordeal the little girl had has been admitted into the malnutrition ward of Hermano Pedro. Well I think I will go and see if I left my coat in the car. The temperature here in Xela dropped down to near freezing last night. It sort of makes me wish that the rooms of this hotel had heat in them. 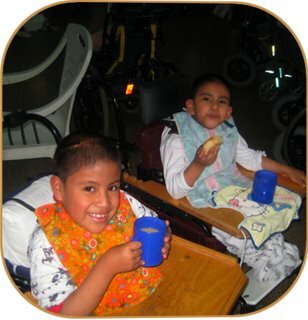 Today was the last day of 3 consecutive days of wheelchair distributions. 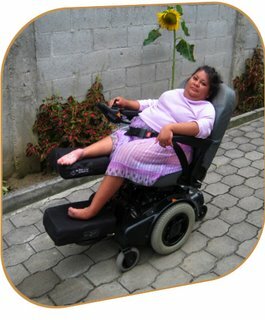 In the past 3 days we have given out and seated 147 wheelchairs. It has been a busy 3 days but we really enjoyed ourselves and the people that came down from the USA to help with the distribution pitched right in and were a real blessing. We finished up near 1 PM so Chris, George, Saul, and Hanna all headed back for home. I am staying here in Xela for a few more days. Several of the people that are here from the USA have asked me to take them to see some of the people that we work with here in Guatemala. Even though I had seen Erica and her family about a week ago we revisited them again today, partly because the 2 people that accompanied me today wanted to meet her and her family and also because I wanted to talk with them about possibley trying a different medicine. The ammonium lactate cream that she is using has done wonders for most of her body but her legs are often covered with the black scales that give them the appearance of burnt leather. I am considering having her try Urea which is a stronger medicine on just one of her legs and then comparing them in a few weeks. One of the men that accompanied me today took his I pod along with him, firs to Erica's house and a bit later to Christopher's house. What ever shyness any of these kids had when I first visited them several years ago is now completely gone. With in minutes Don had all of the kids clapping and dancing right along with him. They all had a great time. Christopher is going to school 3 days a week. The other 2 days are market day in the small town that he has to cross in order to get to school and his mother told us that the narrow streets are so crowded that they are just to difficult and unsafe for him to drive on with his power wheelchair. Christopher seems to be content with going only 3 days and perhaps since he tires quickly it is for the best. His mother still has to carry him about a quarter mile from there home to a friends home where the wheelchair is kept because the trail that leads to there home is to narrow. I am thinking of looking into what it would take to smooth out an widen the trail though because Christopher who is now 13 years old is getting to heavy to carry. Anyway that is what my back is telling me tonight. After visiting at his home today I offered to carry him out to where his wheelchair is. I don't know how his mother can do it day after day. After returning to Xela I stayed and had dinner with my friends who are staying at a different motel than I am and then headed back to mine. It looks like about 5 people will be joining me tomorrow. We plan on visiting Enma and Jose who live about 2 hours from here. If time permits we may go back to Christopher’s house. I want to buy him some heavier duty batteries for his power wheelchair because his ride to and from school is a long hilly one. Well it looks like my Macintosh Power book is giving up the ghost. A few months ago the touch pad and lit keyboard went out on it and tonight the screen started flickering and then turned black. At first I feared that I had lost this weeks pictures and journal but after leaving it turned off for a while and doing a lot of praying I managed to get it running just long enough to get some of those things transferred onto a memory stick. Another fortunate thing is that at the last minute I decided to take the computer that I use for mapping along with me from home. It certainly isn't the computer that my good old Mac was before developing hart trouble but I am grateful to have it. Enma and her son Jose were glad to see us. even though they have next to nothing they are continually thanking God for what they do have. Enma had hugs for everyone and quickly made us feel right at home. Even though the 4 people who had come along with me today had never met her or Jose before the all hit it off right away. 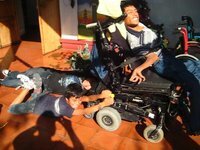 I did some repair on Jose's wheelchair while Enma showed my friends around. Jose kept looking at my car which was parked along side of their house but today I didn’t let him steer it. I know that he loves nothing better but he is getting really big and the last few times that I let him steer my car down the trail that leads in to his house he got so excited that his flailing arms and legs nearly wiped out everything that was in my car, and even though I did my best to hold down his legs and the hand that was not on the steering wheel I managed to get a fat lip and a few bruses. Jose is not trying to deliberately hit me but when he gets excited his hands and feet go wild. Enma is once again having some medical problems so I asked her if she wanted me to try and set up a time when she can come in to Hermano Pedro and see a doctor. She told me that she would ask here married daughter I she would care fo Jose because she know hat she had to get something done. Before leaving we had a time of prayer together. It was 5 pm by the time we got back so I decided to wait until tomorrow to bring the new batteries that we bought this morning to Christopher. I am finally back at home, (well sort of). After 5 days I really miss the kids, (actually I missed them the day I left home). However after not checking or responding to any e-mails since Saturday night I made myself stop off at the shop and do that and my journal so that once I got home I could give the kids my full attention. That was 2 and a half hours and countless e-mails ago. Anyway I have finally finished up with reading and responding to my e-mails and have decided that I better finish up on today’s journal as well. Before heading for home this morning I drove up to San Francisco to give Christopher his new wheelchair batteries. Little did I know that it was market day until I approached the town. I now fully understand why he can not take his wheelchair to school on market day. It took me a long time to get anywhere near his home with my car and once I got there I found out that he and his mother were in town. There was no way that I could get my car any where near to where Christopher and his mother were but his brother offered to walk me there. We had to walk for nearly a mile and the streets were crowded with hundreds of people who were selling anything from pigs and chickens to clothing that they had weaved. We finally got to where Christopher and his mother were. She had a table set up and was trying to sell some used clothing and Christopher was sitting in his wheelchair in a narrow hallway that ran between 2 stores. I told him that we had not carried the new batteries or my tools in with us because I had figured that he could drive his power wheelchair to my car but was now beginning to wander if that was possible. The merchants had tables, boxes, and baskets of merchandise stacked so tightly together that there was scarcely room to walk yet alone take a wheelchair down the narrow streets. We decided to give it a try though so Christopher carefully backed his wheelchair out of the narrow hall way that he was in, His brother and I had to lift it out of the door way and around a few tables just to get it on to the street but then for the most part Christopher was able to drive it the rest of the way to my car. I must say though that the going was not easy, especially for the first few blocks. I think that a lot of people in Christopher’s town still have a long way to go before they are courteous to some one who is in a wheelchair. Many times people would push and crowd in front of him and no one would even attempt to get out of his way. Christopher kept his cool though and slowly maneuvered his power wheelchair around any one or any thing that was in his way. When we got to my car I took out the 2 new batteries only to find out that they did not have the right type of connectors on them . I told Christopher and his brother that there was no problem though because we could get what we needed at any auto parts store. Kenneth, Christopher’s brother, looked at me and said that we still had a problem. He told me that San Francisco had no auto parts store. He said that he and Christopher would gladly come along with me in my car if I wanted to drive back to Xela to get the parts that we needed though. I am not sure if I was being conned or what because I think that both boys wanted a ride in my car but soon we Christopher, Kenneth and I were in my car and heading towards Xela. There is another town that you drive through between San Francesco and Xela but both Christopher and Kenneth insisted that we would find nothing there either. Unfortunately for them but fortunately for me I spotted one though and they had the connectors that we needed. Both boys were a bit disappointed but I explained to them that I still wanted to make it back to Chemaltenango today. When we got back to San Francisco we quickly put the new batteries into Christopher’s wheelchair and I was on my way. Even though it is normally an hour longer I took the Pan American Highway home because I had been told that there were a lot of construction delays on the other road. Speaking of delays Calin called me about a half hour ago and was wondering why I was not at home yet. I am having some computer problems but after hooking up an old monitor to my lap top I am at least able to see what I am doing. The lap top that I use for mapping is not doing much better. The screen lights up but the computer suddenly refuses to connect to the internet. The younger kids are not happy about having no internet for games and the older ones who have not yet come over to do home work will not be to tickled about having no internet on the lap top and no monitor for the desk top. I am not quite sure how they will do there school work but we will figure something out. Would you believe though that other than that and a few dozen other things my day went great today. If I think back even a few years a day like today would have gotten me upset but I am slowly learning to put more and more into God’s hands, or to lay it at His feet. As I suspected, today was kids day. I left for Hermano Pedro early enough that not nearly all of the kids in my neighborhood discovered that I was back at home but Calin, Abner, Fernando, and Lady were all here for breakfast so they accompanied me to the orphanage. All but a few of the kids that went home during Christmas have now returned to the orphanage and it was great to see them. I had promised the 4 kids that came along with me that we would take five of the orphanage kids out to eat but deciding which 5 we would ask was difficult. 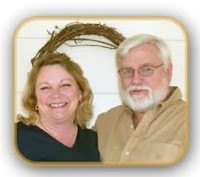 We had planned on taking 7 kids but Jim and Jill ended up having to work at Higher Grounds Coffee House today. 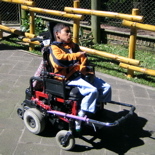 I figured that the kids could trade off on pushing one of the kids to Camperos because Byron had his power wheelchair. However the nurses had failed to charge his batteries so his chair died before we even got out of the door of the orphanage. I guess that I could look at that as a blessing because had it died some where in town it would have been a chore to get him and his chair back home. After exchanging his power wheelchair for a manual one we were all under way. The kids got tired pushing the wheelchairs but all of them stuck with it. Abner lost it a bit when Calin Accidentally ran into the back of his legs with Gasper’s wheelchair but came out of his crying spell in record time. It also helped that when I told the kids that I would phone the group of adults that we were going to show through the orphanage right after lunch and ask of they could meet us at Camperos and then help us push the 5 kids that were in wheelchairs back to the orphanage. Have you ever noticed how even when one of the smallest children spills a soft drink none of it gets on them but it automatically gravitates towards the largest person that is sitting at the table. Oh well, once again I was able to look at the bright side of it knowing that no matter how many of the orphanage kids sat on my lap to day I would not have to worry about getting any wetter than I already was. After I mopped up what little orange soda there was left that had not soaked into my pants I decided to call in reinforcements. I figured that the adults that were going to join us at the orphanage could perhaps not only show up at Camperos in time to help us get the kids back to the orphanage but could possibley join us in time to help feed some of the kids and then help out when we put the kids on the playground equipment. Unfortunately my phone call turned out a little different than planned. I was told that other things had come up and the group was not going to be able to make it in today. I think that kids must have a sixth sense about them though because when they realized that reinforcements were not arriving they all pitched in double time and the rest of the day went rather smoothly. Or at least it went a lot smoother then you would expect it to go with 9 kids 5 of whom were in wheelchairs and one adult who was wondering if they may have to put him in one before the end of the day. After lunch I let the kids play on the slides and other playground equipment for quite a while. As we were playing I saw 2 ladies that were talking to each other as they looked at the kids and then at me. Calin later told me what they were saying. I actually like what I thought they were saying a lot better than what Calin told me that they said though. I guess the words Saint and stupid must sound nearly the same in Spanish. Nevertheless we all had a good time and I plan on taking more kids out on Monday. The rest of our day was spent in playing with some of the kids that didn’t get to go out today. I also spent some time up in the malnutrition ward. Jennifer, has gone home with her parents. She is so fragile that I don’t see how she will make it out of a hospital environment but I know that her parents love and miss her. Julio seems to be doing well and is adapting nicely to his new surroundings. It is still hard to believe that he is 9 years old. At 17 ½ pounds he is a bit less than 2 pounds per year. The 2 year old girl that Amy Deyong brought in a few days ago seems to be doing alright as well. Her mother was there today and she seems like a verry caring person. Perla, and Byron don’t seem to be showing much change. Both of them just lye there with their heads bent so far back that it is a wonder that they can even breath. I try to hold Byron when ever I am there because he has so many tubes and things in him that I think most people are afraid to. At around 4 PM we headed for home. Most of the kids played while Calin and I did some work on my car. The last 5 days on the road once again laid claim to part of my exhaust system and a fog light. I still have not hit any pot holes that helped improve my out of round front wheel so I may have to break down and have that fixed. Well that is about it for another day, so I will say goodnight. Nine of us made it to church this morning. There would have been 11 but Esben and his brother Elder, who were here for breakfast evidently did not have permission to be here. One of their cousins came over and told me that they Had snuck out of their house before anyone else woke up hoping that I would let them come along to church. They kept insisting that they had been given permission but when I told them that I was going to go over to their house and make sure that they did they quickly left with tears in their eyes. We ended up with 11 people in my car on the way home though. I had promised Moises and Byron that I would pick them up at the orphanage and take them along to Abner’s birthday party today. The party was at Abner’s aunt and uncles house, I think that his mother sent some money from the States so that he could have a party because today I was told that I did not have to bring food a cake or anything. We all had a fun time especially the 2 boys that came along from the orphanage. I was suppose to get them back to Hermano Pedro by 4 PM but ended up getting them there about an hour late. It really did not matter though because they had plenty to eat at the party and did not mind missing supper at the orphanage. We stuck around Hermano Pedro for a little while after bringing Moises and Byron back there. Some of my neighborhood kids have not had a chance to see some of the kids that recently returned to Hermano Pedro after spending nearly 2 months at their homes so they wanted to stay and visit for a while. The bond of friendship that these kids have established is beyond words. I wish that more people could be as uninhibited about showing love to the kids at Hermano Pedro as the kids from my neighborhood are. The neighborhood kids also ate well at the party so I figured that this would be a good night to lock the gate and get some work done. That was about an hour ago and so far it has not worked. It is hard to say no to someone who has to do home work or to Esben who is still feeling bad about not being allowed to come along to church this morning. Tomorrow I am suppose to show 2 different groups of people around the orphanage. It is my prayer that some of them will fall in love with the kids and decide to return and spend more time with them. As I was about to leave Hermano Pedro this evening I could not help but walk back to a crib that is located near the back wall of one of the rooms. Hillier Estardo seem to be having a rough time. He is a boy who came into Hermano Pedro under court order about a year ago. No one is quite sure weather his mother continually beat him because he was not quite normal or if he is not quite normal because of the beating that he received. Never the less there have been times that he seems to come out of the protective little world that he locks his mind into and at least shows some emotion. Tonight it was tears. I personaly feel that the tears are better than the blank expressionless stares that are on his face most of the time but would much rather see him smile. I have seen that happen a few times but all too few. Tonight was one of those rare times and all it took was a few minutes of my time showing this precious child that someone cared. After returning Estardo to his crib I heard a far to familiar sound of another child that was starving for attention. This was not the sound of crying but it bothered me just as much. You would think that after all of these years I could just tune it out but I guess that I will never get use to the bang, bang, bang of Sam Sam’s head against the steel bars of his crib. I knew that if I stopped and held him I would only return him to his crib and then be drawn to another. I plan on returning to Hermano Pedro tomorrow, perhaps I can find some time to spend with him then.